The tributes to Cardinal-designate Daniel N. DiNardo have been effusive since he was among 21 archbishops and two priests named cardinals by Pope Benedict XVI Oct. 17. What is less clear is why someone who was a parish priest just 10 years ago, and currently head of the country's newest archdiocese, was chosen to become the first new cardinal in decades -- other than in Los Angeles -- to represent the U.S. South and Southwest. Nobody who makes such decisions at the Vatican is going to tell -- certainly not for publication. But possible clues lie in demographics and history, both of the diocese and of the man. That Cardinal-designate DiNardo, 58, is "an Italian from Pittsburgh who worked in the Curia probably means something," offered Jesuit Father Gerald Fogarty, a historian and religious studies professor at the University of Virginia. David O'Brien, professor of Roman Catholic studies at the College of the Holy Cross in Worcester, Mass., speculated that the choice of Cardinal-designate DiNardo was at least in part the result of the pope "trying to highlight the importance of the growth of the church in the Southwest. It probably had something to do with the area as well as the person." Timothy Matovina, a theology professor and director of the Cushwa Center for the Study of American Catholicism at the University of Notre Dame in Indiana, said simply of Galveston-Houston as a choice for a new cardinal, "It's a booming place." The growth of the Catholic Church in the South and Southwest was cited again and again by various commentators on the inclusion of Galveston-Houston's archbishop among new cardinals. In the 2000 census, the rate of population growth among Catholics was 42 percent in the West and 30 percent in the South, compared to 5 percent and 4 percent, respectively, in the Midwest and the Northeast. Of 17 U.S. cardinals, the only one active in a diocese west of the Mississippi River or south of Washington is Los Angeles Cardinal Roger M. Mahony. Cardinal J. Francis Stafford, former Denver archbishop, was made a cardinal after he left that archdiocese to run the Pontifical Council for the Laity. He currently heads the Vatican's Apostolic Penitentiary. "The Holy Father has sent a strong message that he recognizes the ever-growing importance of Texas as a Catholic state," said Bishop Kevin J. Farrell of the Diocese of Dallas. Washington Archbishop Donald W. Wuerl said the choice "is a recognition of the giftedness and ability of Archbishop DiNardo and also of the important place that the church of Galveston-Houston has in the growing Catholic population in Texas and the entire southwest United States." Then-Father DiNardo served as a priest under then-Bishop Wuerl in Pittsburgh from 1988 until 1997, when he became coadjutor, then bishop of Sioux City, Iowa. (Archbishop Wuerl himself was thought by some to be a candidate for the cardinals' list. 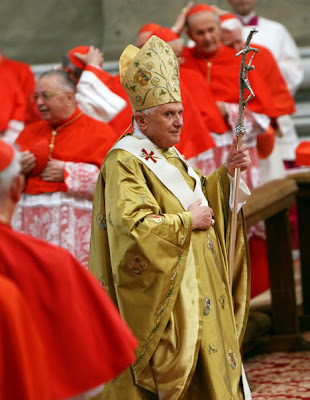 But the Vatican has long avoided having two active members of the College of Cardinals from the same diocese. "I think what the Holy Father and the Holy See are saying is that the whole South and Southwestern part of the United States with its variety of people -- obviously a major portion of whom are Hispanic -- is a noteworthy and beautiful addition for the Catholic Church in the United States and they wanted to recognize that," he said. Some speculated in advance of the list's release that San Antonio and its Archbishop Jose H. Gomez might have the inside track for a red hat. Father Louis Vallone, pastor of St. John of God Parish in McKees Rocks, Pa., who has been friends with Cardinal-designate DiNardo since high school, said he has been predicting for years that his friend was destined for great things and that a cardinal would soon be named for one of four archdioceses -- San Antonio, Miami, Atlanta or Galveston-Houston. Though San Antonio has been an archdiocese since 1926, its Catholic population is only 674,000, compared to Galveston-Houston's 1.5 million. Galveston-Houston only became an archdiocese in 2004, but Galveston was the first diocese in Texas, established in 1847. San Antonio followed in 1874. Among other regional archdioceses, only New Orleans preceded Galveston as a diocese, in 1793, and became an archdiocese in 1850. New Orleans is still recovering from 2005's Hurricane Katrina, however. Before up to half the people in New Orleans left because of the devastation, the archdiocese's Catholic population was 489,000. Matovina, who specializes in studies of U.S. Latino Catholics, said the appeal of Galveston-Houston in the selection of a cardinal could be a factor of the diversity of its new Catholic population. Though largely Latino, there are sizable populations of Asians and Africans as well, he said.